20 October 2017, at 12:00a.m. GERMANY - While the overall focus of Anuga 2017 was on new products and innovation, USMEF expanded its strategy at the five-day food show to identify opportunities for US beef and pork in Europe and surrounding markets. USMEF’s participation was possible through support from the USDA Market Access Programme (MAP) and member companies taking part in Anuga. Keeping a close eye on competitors was also a primary goal. Anuga, a biennial event that is considered the world’s largest food fair, attracted 165,000 visitors to Cologne, Germany. More than 7,400 organizations from 107 countries exhibited. 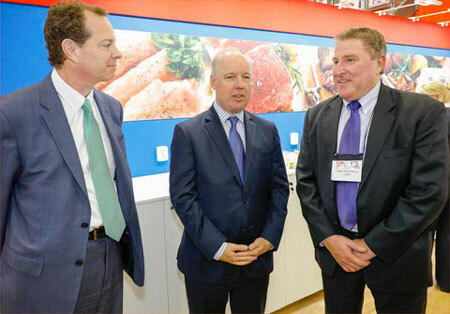 "It’s truly a global food show that, of course, is highly concentrated on European production and trade opportunities in Europe, Russia and the Middle East," said USMEF President Dan Halstrom. "That being said, we also saw quite a bit of influence from Japan, Korea and China, as well as Latin America, so it’s really evolved over the years into a global food show." The 2017 edition of Anuga gave USMEF, along with two dozen member companies that shared its display space in the Meat Hall, an excellent opportunity to witness the competition – both for beef and pork. "On the beef side, the scope of international competition was evident, with a significant presence from Australia, Ireland, Scotland, South America and India – in other words, it is obvious that the US is not the only beef supply source that has targeted this international trade value opportunity," said Mr Halstrom. "Same thing on the pork side. There was very strong influence from the Europeans, be it German pork or Spanish pork. Also, there was a strong presence for South American pork. So this drives home how important international trade is not only for the US but also for our competitors. "More importantly, the reception to US red meat at this year’s Anuga confirms that we are well-positioned as a supplier of safe, high-quality pork and beef that can make a strong impact on global demand." Anuga organisers reported that the 165,000 visitors to this year’s show came from 198 countries. USMEF was able to take advantage of this diverse audience, educating buyers from new and emerging markets around the world through face-to-face meetings and tastings of US beef and pork. At the same time, existing customers were updated on the US red meat industry, including status reports on product availability. Yuri Barutkin, USMEF representative in Europe, said discussions at Anuga resulted in many plans and projects for the coming year – with existing and new partners. "US beef producers are aware that EU business is not only about margins but it is also about image – selling to the EU is seen across the world as a statement of high quality and superb safety," Mr Barutkin said. "That image helps US sell more elsewhere around the globe." Discussions with buyers and importers revealed that demand for US red meat remains high, despite ongoing challenges with pricing and trade issues. "One of the largest opportunities for the US in the EU market is with high-quality, grain-fed beef," said Mr Halstrom. "We have a very high-end niche business in the EU, and it’s also some of the most expensive beef that goes into Europe. But there is a demand, and it is growing." Mr Halstrom noted that one trade issue frequently talked about at Anuga 2017 was the fact that the "481 quota" – the EU’s duty-free high-quality beef quota that is administered on a quarterly basis – is being filled halfway through each quarter. "The quota’s over-subscription interrupts supply – not only for US beef but also for Uruguayan and Australian beef and others," explained Mr Halstrom. "So one of the things the US industry is working very closely on with the EU is the creation of a 'US-only' quota, and we’re optimistic that something can be concluded on that so that we can not only avoid disruption of US beef supply into the EU today, but also ensure room for growth in the future." Mr Barutkin added that many "quota discussions" at Anuga revolved around the US beef industry’s continued commitment to the EU. "In a way, we saw our role at the show as telling our partners in the EU that the US beef industry wants not only to maintain its share of the EU high-quality beef market but to develop ways to create more demand for US product. There were many discussions with foodservice distributors from various EU markets on how they can develop a market for US beef. This is the kind of action it is going to take to be successful." USMEF hosted lunches at its display inside the Meat Hall, including one for Kent Logsdon, interim chargé d’affaires at the US Embassy in Germany, and his staff. The embassy crew was served a lunch featuring US beef ribeye during Logsdon’s visit to the show. The next Anuga will take place from 5 to 9 October 2019.